Having two mats at each entrance can keep floors clean. If you want to keep your cleaning costs down, entrance mats are a great way to reduce the amount of dirt and moisture that comes from outside. By putting an entrance mat outside to catch any of the loose dirt first, and then having a second one in the lobby to reduce and absorb the moisture that might be tracked in, you’ll keep your floors much cleaner. Having double entrance mats can help keep the weather where it belongs – outside. It’s a good idea for building managers to not only have two at each entrance, but also extras on hand in the event they get too weighed down by dirt and water. This way, you can clean them every once and a while but you don’t have to worry about your floors being unprotected. The more entrance mats you have on hand, the more peace of mind you’ll have that your floors are clean. Being sure to buy logo mats with absorption capabilities can help retain moisture and keep it where it should be, away from the floor. This can also help keep any visitors from experiencing falls if they’re entering during a particularly hazardous weather day. Always make sure your entrance mat is in good condition. When you’re trying to make a good impression while also looking after the safety of your guests, entrance mats are a great way to do both. You can customize entrance mats to include your logo and branding, so guests know where they are the second they set foot through the door, but they also provide traction and a way for people to wipe their shoes as they walk in. This keeps buildup in the lobby and your floors looking clean. When trying to choose an entrance mat, make sure you’re picking bold colors that relate to your brand. Also consider having a few on hand in the event they get dirty or filled with water and snow. This way, you can quickly change them out when they’re looking a little worse for wear while still leaving a good impression. They’re a great way to put the safety of your team and visitors first while still being visually appealing. Entrance mats have multiple purposes, but at the end of the day, it’s the first impression that makes the biggest difference to passersby. Consider changing yours out every couple of years for a more updated look, particularly if you’re also changing your business’s decor. Entrance mats help keep weather from coming in. 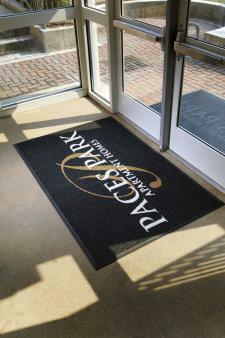 Entrance mats are the perfect way to keep the winter weather outside your workplace. With salt, sand and ice building up on roads and sidewalks, it’s easy for people to track in residue on the bottoms of their shoes, potentially ruing floors and also creating a slipping hazard. However, entrance mats with gripping are a great way to pick up dirt and salt, but also absorb any moisture that is tracked in. If you work in a heavily trafficked area, chances are the entryway will get dirty quickly. Not only will entrance mats camouflage a lot of the outdoor residue that’s coming inside, but they serve as a way to greet employees and potential customers as they walk through the door. When choosing an entrance mat, it’s a good idea to look for ones made of absorbent material, so they can pick up any excess moisture brought in from people’s shoes without causing a puddle. However, in addition to the entrance mat, it’s a good idea to have a caution sign nearby in the event some of the moisture lingers, potentially putting people at risk for slipping. This will also encourage more people to be diligent about wiping their feet before they set foot on the floor. Entrance mats are a great way to keep visitors safe. The winter means icy pathways that can increase a person’s chances of taking an unintentional spill. Unfortunately, the threat continues even when heading indoors, as boots track in snow and ice, increasing the chances of people slipping on tile or hardwood floors. Having an entrance mat can help negate this risk, because they can absorb the moisture that’s typically at the bottom of guests shoes. According to Consumer Reports, it’s important to always walk with caution and be aware of surroundings. In addition to having an entrance mat, you may want to consider having a wet floor sign in your entryway to alert people that there could be puddles. You should also be sure to have salt on the outside to help reduce the ice buildup and also provide some traction as people are walking. EHS Today reports that it’s never too early to think about putting a winter safety plan in action. The news provider says that winter spills can have a negative impact on business because not only are injured customers costly, but having an employee miss work due to an injury can impact both your efficiency and your worker’s compensation budget. You should always try to be extra careful when putting a plan in place and think about all the hazards.